Realized with Robin Quaas, architect. 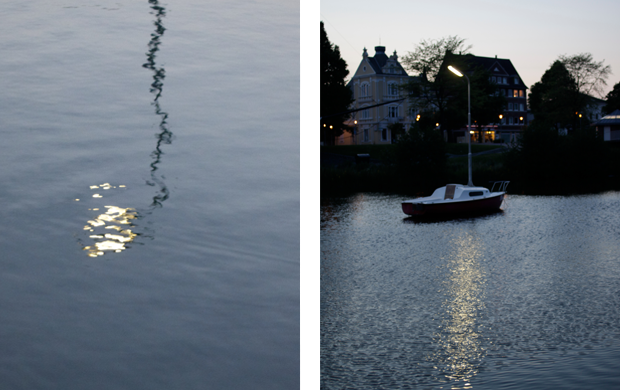 Sailing boat (5,50m), street lamp functioning at the place of the city’s public lighting. Exhibition view Vier Bücher at Cuxhavener Kunstverein, Cuxhaven (De). a musical form dates back to the English expression “I’ve got the blues” or “I feel blue”, which means “I am sad”. Moreover, an acoustic stimulus expands the image. 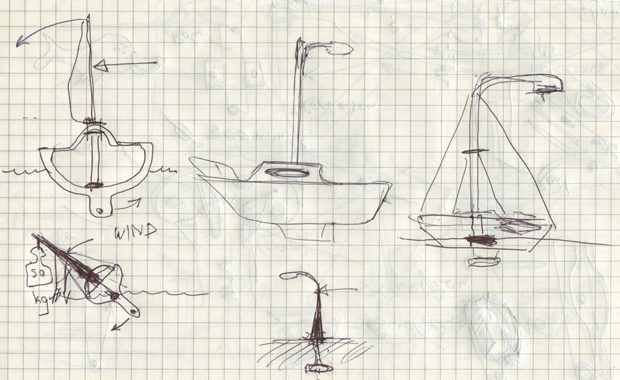 It is triggered by the lamp’s cable inside of the mast whenever the boat moves. The sound can be heard sometimes more, sometimes less clearly. When creating his art pieces, Matthieu Martin is driven by an interest in publicspaces and their organization and design. The latter does not necessarily have to be apparent. By definition, public spaces are open to the public. Nevertheless, there are power relations that affect and organize these spaces and can be described as “invi-sible design” (Lucius Burckhardt). Burckhardt defines this term as “human accomplishments that do not transform matter, but still influence our lives and shape our environment decisively”1, just like the light cast by a lamp post, that chan-ged people’s habits considerably. Martin wants to display these power rela-tions intrinsic to public spaces by way of his art pieces, which sometimes only consist of small gestures or minimal changes. On closer inspection, the quiet and poetic side becomes gradually louder and percep-tible. As is typical of many of Martin’s pieces, “Blues” contains a funny twist. This is not only generated by the composi-tion of the materials alone, but also by the location he chose to display his piece. 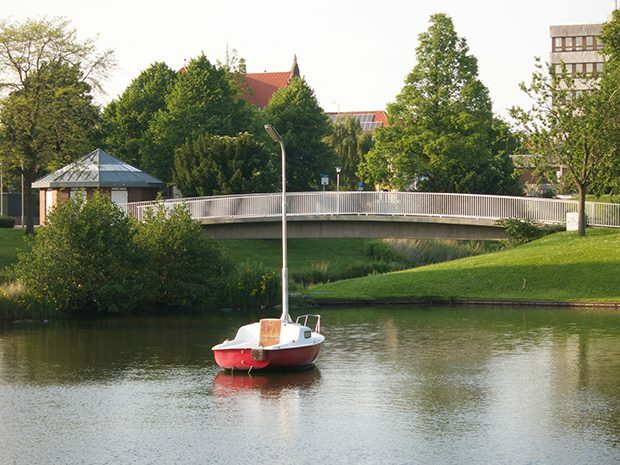 With its small size and shallow depth the Schleusenprielbecken is only attractive to toy boats and ducks. In a way, the artist carried the sailboat and the lamp post to foreign territory, which makes a mockery of the function assigned to these objects. Without its mast and sail the sailboat lacks the necessary space that also signifies freedom. And now the lamp no longer serves to light the street, it no longer serves the people who walk and drive there, but it casts its light onto the boat at night, while everything around it stays dark. 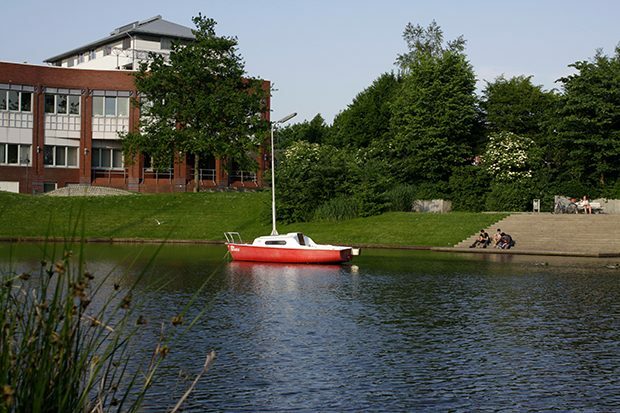 The installation in the public space of Cux-haven becomes an object on display that puzzles onlookers, just as it would in an art exhibition or in a museum. 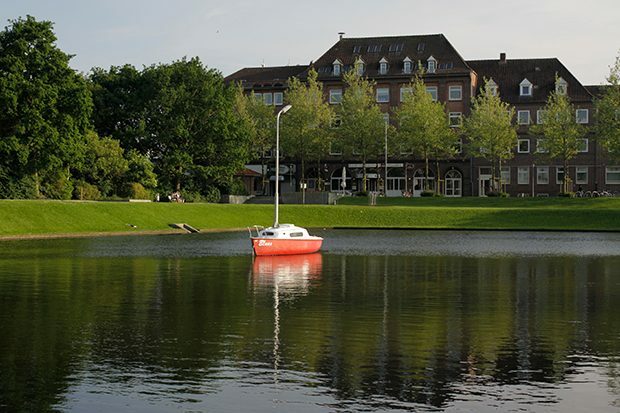 The art piece “Blues” was created as part of an exhibition called “Abschiede – Les Adieux”, which belongs to the exhibition sequences “Vier Bücher” presented by the Cuxhaven Art Association in 2014, and which takes Cuxhaven’s history of immi-gration as a starting point. 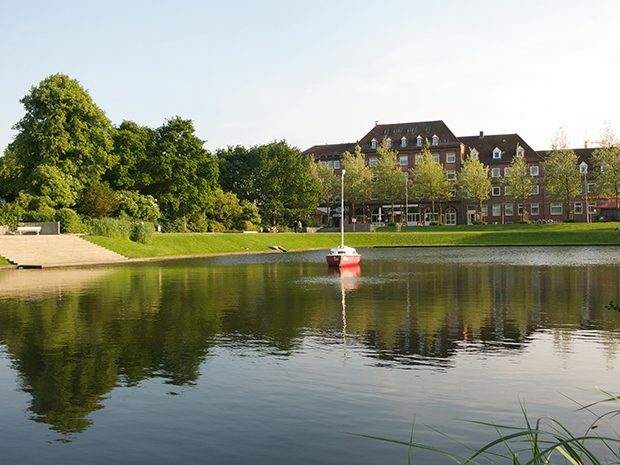 For many people Cuxhaven was the last stop in Europe after which they undertook the long and arduous trip by ship to America.